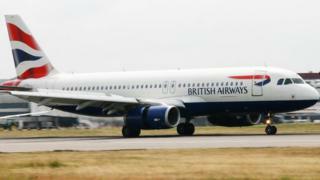 A plane approaching Heathrow Airport is believed to have hit a drone before it landed safely, the Metropolitan Police has said. If confirmed, it is believed to be the first incident of its kind in the UK. A Civil Aviation Authority (CAA) spokesman said it was "totally unacceptable" to fly drones close to airports, and anyone flouting the rules can face "severe penalties, including imprisonment". Steve Landells, from the British Airline Pilots Association (Balpa), said it had been "only a matter of time before we had a drone strike". He called for greater enforcement of existing rules. Flying a drone near an airport can already be punished with up to five years in prison, and rules also forbid taking them above 400ft (122m) or near buildings and crowds of people. But the latest incident will only add to the pressure for further steps to be taken. The US recently introduced a compulsory registration scheme so any drone recovered from an accident can be traced back to its owner. In addition, officials could make it mandatory for drones to run geo-fencing software - that would prevent them flying in restricted areas. The Department for Transport has promised to publish a strategy for unmanned aircraft this year. And pilots have also called for the DoT to fund tests into what would happen if a drone got sucked into an engine or crashed into a plane's windscreen. Last month, the British Airline Pilots Association noted that while the threat of bird strikes had been well researched there was little data about how much damage a drone could cause a plane. The UK Air Proximity Board - which investigates near-miss incidents in UK airspace - said there have been a number of serious near-misses at UK airports involving drones. Category A incidents - the most serious - were reported at Stansted, Heathrow, London City and Manchester airports last year.